The game serves as an effective blackjack training tool, and it allows punters the chance to play with other players from around the world. The game has a max bet of 500 credits and a minimum of 1. There are seats for up to five players, and you have the option to do standard blackjack decisions such as hit, stand, split, double down, and take insurance. In addition to desktop play, punters can also test their luck on their mobile devices, with the experience being nearly identical across both platforms. Knowing good blackjack strategy is key to success in the game, as knowing the skill aids in your overall success. 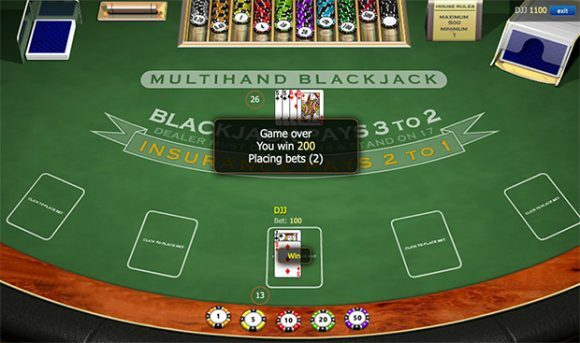 While luck certainly plays a large component, blackjack is one of the few casino games that has an element of strategy. Players who bone up on their strategy can then move to real money games, where they can put boots to pavement and try their luck for some real dough. BlackjackInfo serves as a sister site to Online Blackjack, providing educational materials and selling strategy cards, as well as having an active forum where punters can discuss the game with other like-minded players. I gave this a try earlier today. Worked pretty good, not bad for a free game. Now we just need some extra players to get in on the action!